Tree removal in Forth Worth, TX can be a risky endeavor. Always trust a professional in order to ensure the safety of your home and property. Our experts will remove your tree and stump without damaging your property or surrounding landscape, and can even replant in the space if desired. Call our professionals at (817) 717-7737 when your need hassle-free tree removal services in Forth Worth, TX. 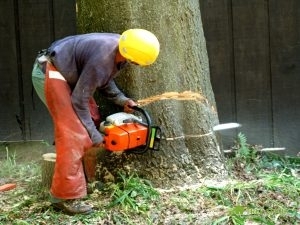 When you need safe, dependable tree removal, call the experts at Tree Spark! There many reasons for tree removal. From trees that have outgrown their home to dead trees that pose a risk to your family, our experts can help you remove your problem trees without making a dent in your landscape or your wallet. Sometimes, a tree is growing too close to your house, threatening damages like falling branches or foundation cracks. This can be particularly troublesome for larger trees with a deep root system and can cause thousands of dollars in damage if not tended to properly. Dying or dead trees in your yard can pose dangers to your home and family. Trees that are dead break very easily, causing limbs to fall on both homes and bystanders. Trees with problems such as disease can be harmful to the rest of the foliage in your yard. Sometimes, diseased trees can be rescued with the correct professional diagnosis and recovery plan, but trees that are too diseased or already dead should be removed as soon as possible. Too many trees can lead to lack of nutrients, which can lead unhealthiness and stunted growth. For trees to grow to their full potential, they must have the right amount of space and nutrients. Tree removal may be necessary at times to thin the tree growth and guarantee proper space requirements for the healthiest of the bunch. Likewise, too much shade in your yard may be causing stunted growth of other foliage like grass or flowers. Sometimes, regular tree trimming can be performed to eliminate the problem. However, at times, full tree removal may be needed to ensure proper sunlight to the rest of your lawn. If you need trees removed in Forth Worth, TX, call the experts at Tree Spark to ensure your job is done quickly and without wrecking your lawn. Contact our service consultants today at (817) 717-7737 and get the yard you’ve always wanted. Updated on August 31, 2018 at 4:43 pm by Tree Spark.